A Victorian Aesthetic sterling & 2 colour gold brooch. This fine quality Victorian period round engraved sterling brooch has applied engraved leaves in pink and green gold and it dates to the 1875-85 era. This 1-3/8" elegant Aesthetic design pin is unsigned but tests as sterling, and it features balls around the perimeter, a ridged border and central hand engraving. The textured and engraved leaves in gold are applied sections of sheet gold, and this pin closes with a c-clasp. This item is in excellent original condition with no scrapes, dents, monograms, corrosion, losses, damage or repairs other than to three edge balls which have been slightly pushed upwards (barely noticeable). All items are thoroughly and conservatively graded and all condition issues are noted; all items are vintage or antique and may have slight signs of gentle use. Expedited tracked and insured parcel shipping to the U.S. starts at $19 (other spots may vary, air is higher). Items paid with a credit card will be shipped to confirmed addresses only. We do ship internationally. All of our prices are in $US. PLEASE NOTE: We DO NOT accept PayPal. 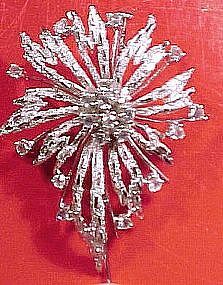 A stylish vintage sterling silver and sparkly crystal flower pin c1950s-60. This 2" x 1-1/2" pin features claw-set white crystal stones (unfoiled), a textured finish, and a trombone clasp. It has a reverse facing RR maker's mark and STERLING, and it is in excellent original condition with no chips, dents, monograms, bends, corrosion, losses, damage or repairs. Not one of our better photo attempts, the pictures appear is bit blurry, but the stones and pin have great sparkle in real life. Small packet surface shipping is $6.70 (to the US - other spots may vary, air post and FedEx are higher) - insurance is included. We do ship internationally. All of our prices are in $US. PLEASE NOTE: We DO NOT accept Paypal, only VISA and MASTERCARD. 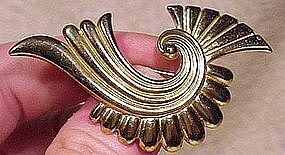 A retro gilt sterling pin brooch from the 1940s. This 2-1/2" x 1-3/8" pin has a safety catch, and is is signed ARO STERLING. This item is in excellent original condition with no scrapes, dents, monograms, bends, corrosion, losses, damage or repairs. All items are thoroughly and conservatively graded and all condition issues are noted; all items are vintage or antique and may have slight signs of gentle use. Tracked Packet shipping to anywhere in the U.S. is $14.00 - this includes online tracking, air service and insurance up to $70. Items paid with a credit card will be shipped to confirmed addresses only. We do ship internationally. All of our prices are in $US. PLEASE NOTE: We DO NOT accept PayPal. 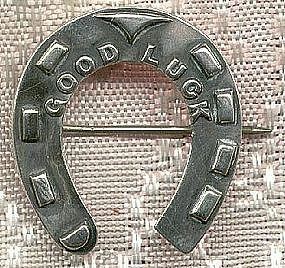 A late Victorian or Edwardian vintage sterling silver pin with a mounting bar, to hold a ribbon, military/decorative medal or ribbon fob c1890-1910. 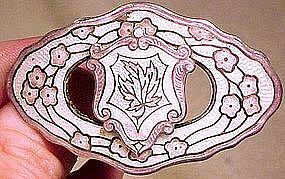 It measures 1-1/2" x 1/2" and it has a deeply carved floral design and a matte or satin finish. It has a 1-18" (27 mm) closed bar below the pin to hold a medal or ribbon fob. It has not ever been monogrammed or engraved, and it is marked STERLING with the maker's or retailer's mark for George Lees & Co of Hamilton, Canada (known to exist 1885-1915). This item is in excellent original condition with no scrapes, dents, monograms, bends, corrosion, losses, damage or repairs. All items are thoroughly and conservatively graded and all condition issues are noted. Surface shipping starts at $6 (to the US - other spots may vary) - insured is higher, and mandatory on items over $85 if paid with a credit card. We do ship internationally. All of our prices are in $US. Please note that we do NOT accept Paypal. A 1920s marcasite sterling openwork bow pin. This high quality 2-1/8 x 1/2" bow pin has flashy marcasites and a safety catch; it is unsigned and it is in excellent original condition with no chips, cracks, scrapes, dents, monograms, bends, corrosion, losses, damage or repairs. All items are thoroughly and conservatively graded and all condition issues are noted. Surface shipping starts at $6.30 (to the US - other spots may vary) - insured is higher, and mandatory on items over $95 if paid with a credit card. We do ship internationally. All of our prices are in $US. Please note that we do NOT accept Paypal. 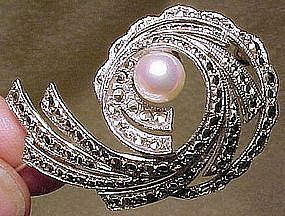 An Eatons sterling marquisite and cultured pearl swirl pin 1950s. This 1-3/4 x 1-3/8" pin has a safety catch, and it is laden with glinting marcasites. It has a 7 mm. cultured pearl with a fine and deep pinkish lustre. It is stamped STERLING with the Eaton's E in a diamond mark (Canada's top retailer of jewellery and fine goods). This item is in excellent original condition with no chips, cracks, scrapes, dents, monograms, bends, corrosion, losses, damage or repairs. All items are thoroughly and conservatively graded and all condition issues are noted; all items are vintage or antique and may have slight signs of gentle use. Tracked Packet shipping to anywhere in the U.S. is $14.00 - this includes online tracking, air service and insurance up to $70. Items paid with a credit card will be shipped to confirmed addresses only. We do ship internationally. All of our prices are in $US. PLEASE NOTE: We DO NOT accept PayPal. A large vintage Mexican sterling baby deer pin c1930s-40. 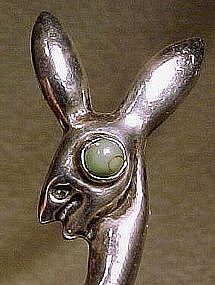 This 3" x 1-3/8" pin is of hollow construction, and it has a green turquoise glass eye. It has a safety catch, and it is stamped PLATA STERLING 925. It weighs 6.2 grams, and it is in excellent original condition with no chips, cracks, scrapes, dents, monograms, bends, corrosion, losses, damage or repairs; the eye has a straw mark original to the glass. All items are thoroughly and conservatively graded and all condition issues are noted; all items are secondhand and may have slight signs of gentle use. Tracked packet air insured shipping starts at $16.85 (to the US - other spots may vary) - insurance/tracking is included. Credit card paid items will be shipped to confirmed addresses only. We do ship internationally. All of our prices are in $US. PLEASE NOTE: WE DO NOT accept PayPal, only VISA and MASTERCARD. 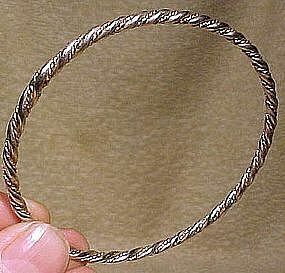 A simple and elegant sterling silver twist-rope braid style bangle. This unmarked but tested bracelet measures 2-1/2" across the interior and 1/8" wide, it weighs 12.9 grams, and it is in excellent original condition with no scrapes, dents, monograms, bends, corrosion, losses, damage or repairs. All items are thoroughly and conservatively graded and all condition issues are noted; all items are secondhand and may have slight signs of gentle use. Small packet air shipping to the U.S. starts at $9.50 (other spots may vary). Items paid with a credit card will be shipped to confirmed addresses only. We do ship internationally. All of our prices are in $US. PLEASE NOTE: We DO NOT accept PayPal, only VISA and MASTERCARD. 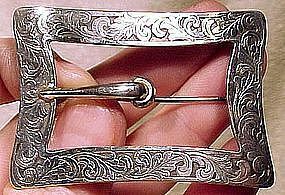 A lovely early 19th century sterling silver & paste belt buckle. This 2-7/8" x 1-3/8" buckle features antique hand cut clear paste stones, and the central pinion hinged section swings either way, with three teeth to hold the belt opening and the section that holds the belt end has three shallower teeth to secure the other end of the belt. They are both secured to the centre of the belt but are made so each moves independently of the other. It is a substantial and very well constructed piece, and still retains traces of its original gilding on the back of the buckle. It is not marked, which was fairly common, but has been tested & is guaranteed to be sterling grade silver. It is in excellent condition with no cracks, losses, corrosion, repairs or damage. A few of the paste stones have very minute surface edge abrasions, as may be expected, but none are serious or detract from the appearance of the buckle, and generally require a loupe to see, but without the loupe it appears in astonishingly great condition. Expedited insured tracked air post to the U.S. starts at $20 US (other spots may vary) - insurance and tracking included in shipping quotes. Items paid with a credit card will be shipped to confirmed addresses only. All of our prices are in $US. PLEASE NOTE: WE DO NOT accept PayPal, only VISA and MASTERCARD. A large, lavish Art Nouveau design sterling and enamel Canadian military sweetheart pin c1900-20. This 2-1/2" x 1-7/16" pin features subtle and lovely lavender enamel flowers and borders, and it is on a textured sterling ground. There is a soldered shield with a central maple leaf applied to the pin, and it has blackened borders around the details - I believe it is a World War One or a Boer War period sweetheart or wives brooch. 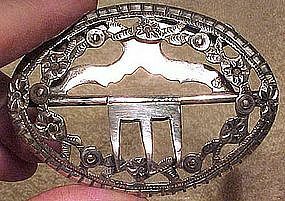 It closes with a c-clasp, and it is stamped STERLING with the DJ and Castle maker's mark. This item is in excellent condition with no chips, cracks, corrosion, repairs or damage. There is a spot on the upper part of the brooch where the enamel looks unfinished, but it is only that there is a bit too much silver there (original to the manufacture of the piece). Shipping is $5 (to the US - other spots may vary) - insured is higher. We do ship internationally. All of our prices are in $US. 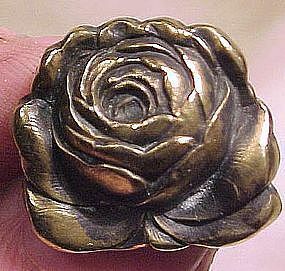 An Art Nouveau gilt sterling silver rose pin 1890 1900. 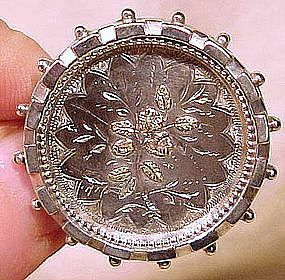 As was typical of the sterling high relief hollow brooches of this period, the back is flat. This 3/4" across pin closes with a c-clasp, it is stamped STERLING, and it is in excellent condition with no dents, cracks, losses, corrosion, repairs or damage. All items are thoroughly and conservatively graded and all condition issues are noted; all items are vintage or antique and may have slight signs of gentle use. Tracked Packet shipping to anywhere in the U.S. is $14.00 - this includes online tracking, air service and insurance up to $70. Items paid with a credit card will be shipped to confirmed addresses only. We do ship internationally. All of our prices are in $US. PLEASE NOTE: We DO NOT accept PayPal. 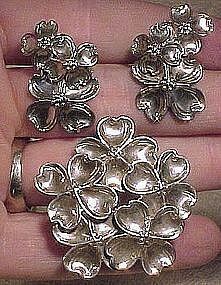 An attractive signed Lang brooch and earrings set in sterling silver c1930s. This set consists of the the 1-3/4" brooch with safety catch and the 1-1/8" x 1" screwback earrings. They are in the form of layered Dogwood flowers, and this set is in excellent condition with no scrapes, dents, monograms, bends, corrosion, losses, damage or repairs. All items are thoroughly and conservatively graded and all condition issues are noted; all items are secondhand and may have slight signs of gentle use. Small packet air shipping starts at $9.50 (to the US - other spots may vary). Credit card items will be shipped to confirmed billing addresses only. We do ship internationally. All of our prices are in $US. PLEASE NOTE: WE DO NOT accept PayPal, only VISA and MASTERCARD. 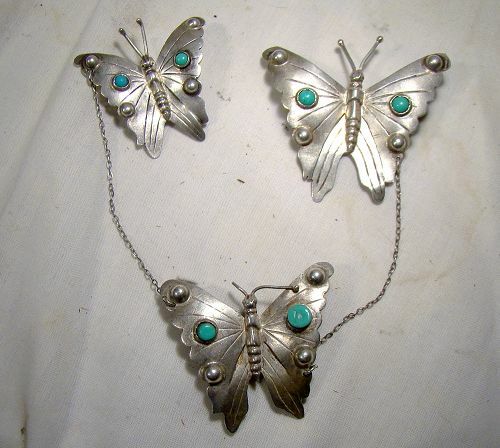 A 1930s Mexican sterling three butterfly swag or sweater brooch. This unusual vintage Mexican sterling pin is in the form of three chain-linked butterflies with glass turquoise cabochons and dates to the 1930s. This pin has three different sized butterflies (all with their own pins on back), with the largest 1-7/8" across and the smallest 1-3/8". Each segment has a safety catch pin and each is stamped MEXICO STERLING. This item is in very good original condition with no chips, cracks, scrapes, dents, monograms, bends, corrosion, losses or damage other than a crease in the surface of one cabochon on the large butterfly, one antenna on the middle butterfly has broken off leaving 1/4" at the insect's head, and one of the turquoise glass stones has been glued upside down on the medium butterfly. All items are thoroughly and conservatively graded and all condition issues are noted; all items are vintage or antique and may have slight signs of gentle use. Tracked Packet shipping to anywhere in the U.S. is $14.00 - this includes online tracking, air service and insurance up to $70. Items paid with a credit card will be shipped to confirmed addresses only. We do ship internationally. All of our prices are in $US. PLEASE NOTE: We DO NOT accept PayPal.